Inside the warm ambiance of Row House Café in South Lake Union, three local Butoh dancers and an artist collaborated to create an interactive performance combining dance, visual, music and culinary arts. 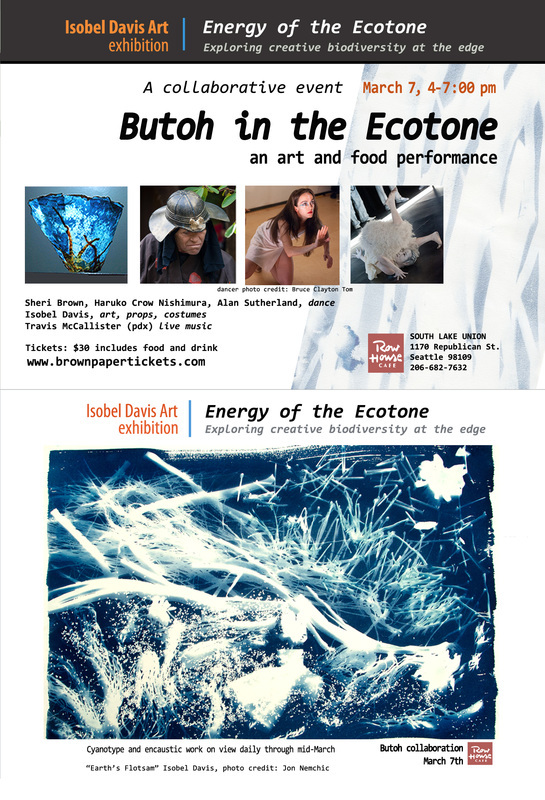 Alan Sutherland, Haruko Crow Nishimura (Degenerate Art Ensemble), and Sheri Cidro Brown (DAIPAN) join Isobel Davis’ visual art exploration of the edge effect in her hung work, "Energy of the Ecotone", (on view at Row House Café through April 8th). The show filled every nook and cranny with art, artifacts, costumes, food & beverage, and music collectively embodying the creative energy of biological diversity. Travis McAllister (PDX) provided live music, and Row House Café chef Carmel Spiro created the ritualistic communal culinary tasting. This very special event at Row House Café on Saturday, March 7th included a special ceremonial beverage & tasting, entertainment, and the full butoh and art experience. A unique journey of sight, sound, movement, music, interactive elements, and communal assimilation. “We wanted to offer the audience a way to enter the exploration of this dynamic microcosm, an imagined world where we can dream of being together in a different way,” says Sheri Brown, one of the dancer/choreographer trio. Isobel Davis’ has installed a body of cyanotype works that examine life in transition in the ecotone, a zone where ecosystems intersect leading to explosive biodiversity. The ecotone is the area of transition between biological communities birthing the edge effect where more diversity exists than on the flanking communities. Nature’s creativity at the edges is an instructive counterpoint to doom-and-gloom climate scenarios in biological and social landscapes. The cyanotype process allows her to co-create with the sun by laying material on prepared paper and developed in water. Her cyanotypes record the variable effects of sun and weather, and embody the energy and life in this transition zone. Isobel has been exploring related themes for the last few years. She has a studio at Inscape Arts building in the International District.